Semiconductor Engineering - What Does An AI Chip Look Like? Semiconductor Engineering - What Does An AI Chip Look Like? Home > System-Level Design > What Does An AI Chip Look Like? Depending upon your point of reference, artificial intelligence will be the next big thing or it will play a major role in all of the next big things. This explains the frenzy of activity in this sector over the past 18 months. Big companies are paying billions of dollars to acquire startup companies, and even more for R&D. In addition, governments around the globe are pouring additional billions into universities and research houses. A global race is underway to create the best architectures and systems to handle the huge volumes of data that need to be processed to make AI work. Market projections are rising accordingly. 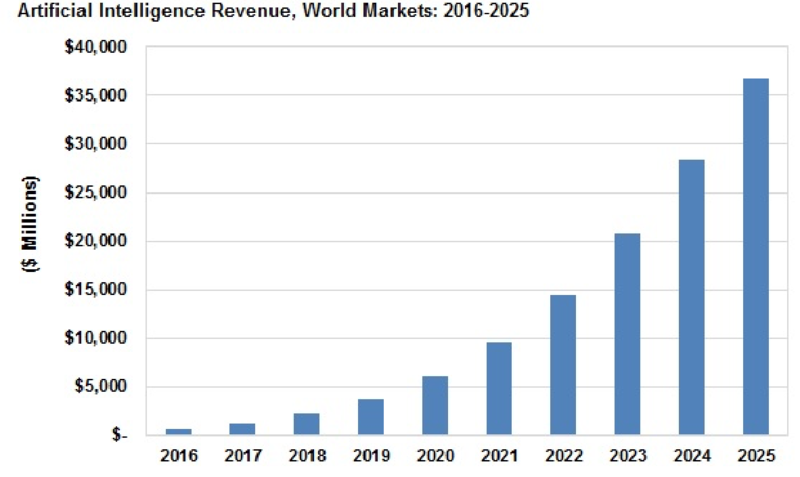 Annual AI revenues are predicted to reach $36.8 billion by 2025, according to Tractica. The research house says it has identified 27 different industry segments and 191 use cases for AI so far. But dig deeper and it quickly becomes apparent there is no single best way to tackle AI. In fact, there isn’t even a consistent definition of what AI is or the data types that will need to be analyzed. So far there are few answers, which is why the first chips in this market include various combinations of off-the-shelf CPUs, GPUs, FPGAs and DSPs. While new designs are under development by companies such as Intel, Google, Nvidia, Qualcomm and IBM, it’s not clear whose approach will win. It appears that at least one CPU always will be required to control these systems, but as streaming data is parallelized, co-processors of various types will be required. Much of the processing in AI involves matrix multiplication and addition. Large numbers of GPUs working in parallel offer an inexpensive approach, but the penalty is higher power. FPGAs with built-in DSP blocks and local memory are more energy efficient, but they generally are more expensive. This also is a segment where software and hardware really need to be co-developed, but much of the software is far behind the hardware. Vision processing has received most of the attention when it comes to AI, largely because Tesla has introduced self-driving capabilities nearly 15 years before the expected rollout of autonomous vehicles. That has opened a huge market for this technology, and for chip and overall system architectures needed to process data collected by image sensors, radar and LiDAR. But many economists and consulting firms are looking beyond this market to how AI will affect overall productivity. A recent report from Accenture predicts that AI will more than double GDP for some countries (see Fig. 2 below). While that is expected to cause significant disruption in jobs, the overall revenue improvement is too big to ignore. Fig. 2: AI’s projected impact. Aart de Geus, chairman and co-CEO of Synopsys, points to three waves of electronics—computation and networking, mobility, and digital intelligence. In the latter category, the focus shifts from the technology itself to what it can do for people. Vision processing in self-driving dominates much of the current research in AI, but the technology also has a growing role in drones and robotics. FPGAs are very good at matrix multiplication. On top of that, programmability adds some necessary flexibility and future-proofing into designs, because at this point it is not clear where the so-called intelligence will reside in a design. Some of the data used to make decisions will be processed locally, some will be processed in data centers. But the percentage of each could change for each implementation. That has a big impact on AI chip and software design. While the big picture for AI hasn’t changed much—most of what is labeled AI is closer to machine learning than true AI—the understanding of how to build these systems has changed significantly. Where this differs from true artificial intelligence is that the current state of the art is being able to detect and avoid objects, while true artificial intelligence would be able to add a level of reasoning, such as how to get through a throng of people cross a street or whether a child chasing a ball is likely to run into the street. In the former, judgments are based on input from a variety of sensors based upon massive data crunching and pre-programmed behavior. In the latter, machines would be able to make value judgments, such as the many possible consequences of swerving to avoid the child—and which is the best choice. This is what is missing in many of the designs today because so much of the development is built with off-the-shelf parts. Google is attempting to alter that formula. The company has developed Tensor processing units (TPUs), which are ASICs created specifically for machine learning. And in an effort to speed up AI development, the company in 2015 turned its TensorFlow software into open source. Fig. 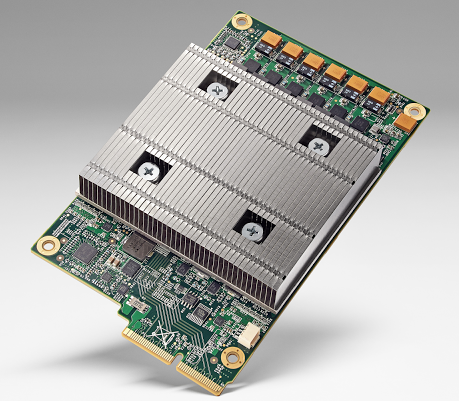 3: Google’s TPU board. Source: Google. Others have their own platforms. But none of these is expected to be the final product. This is an evolution, and no one is quite sure how AI will evolve over the next decade. That’s partly due to the fact that use cases are still being discovered for this technology. And what works in one area, such as vision processing, is not necessarily good for another application, such as determining whether an odor is dangerous or benign, or possibly a combination of both. That is expected to change, however, as the problems being solved become more targeted. Just as with the early versions of IoT devices, no one quite knew how various markets would evolve so systems companies threw in everything and rushed products to market using existing chip technology. In the case of smart watches, the result was a battery that only lasted several hours between charges. As new chips are developed for those specific applications, power and performance are balanced through a combination of more targeted functionality, more intelligent distribution of how processing is parsed between a local device and the cloud, and a better understanding of where the bottlenecks are in a design. He noted that the problems being solved on the software side need to be looked at from a higher level of abstraction, because it makes them easier to constrain and fix. That’s one key piece of the puzzle. As AI makes inroads into more markets, all of this technology will need to evolve to achieve the same kinds of efficiencies that the tech industry in general, and the semiconductor industry in particular, have demonstrated in the past. As more use cases are established for AI beyond autonomous vehicles, adoption will expand. This is why Intel bought Nervana last August. Nervana develops 2.5D deep learning chips that utilize a high-performance processor core, moving data across an interposer to high-bandwidth memory. The stated goal is a 100X reduction in time to train a deep learning model as compared with GPU-based solutions. He said there are two challenges to solve with these devices. One is reliability and certification. The other is security. With AI, reliability needs to be considered at a system level, which includes both hardware and software. ARM’s acquisition of Allinea in December provided one reference point. Another comes out of Stanford University, where researchers are trying to quantify the impact of trimming computations from software. They have discovered that massive cutting, or pruning, doesn’t significantly impact the end product. University of California at Berkeley has been developing a similar approach based upon computing that is less than 100% accurate. 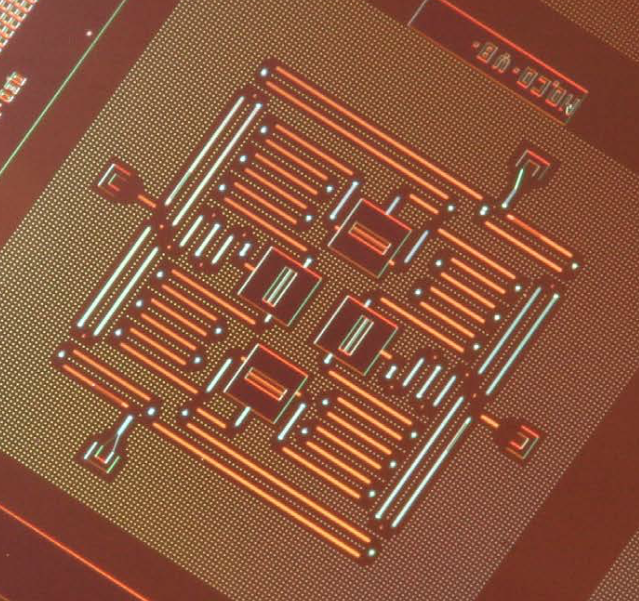 Quantum computing adds yet another option for AI systems. Leti CEO Marie Semeria said quantum computing is one of the future directions for her group, particularly for artificial intelligence applications. And Dario Gil, vice president of science and solutions at IBM Research, explained that using classical computing, there is a one in four chance of guessing which of four cards is red if the other three are blue. Using a quantum computer and entangling of superimposed qubits, by reversing the entanglement the system will provide a correct answer every time. Fig. 5: Quantum processor. Source: IBM. AI is not one thing, and consequently there is no single system that works everywhere optimally. But there are some general requirements for AI systems, as shown in the chart below. And AI does have applications across many markets, all of which will require extensive refinement, expensive tooling, and an ecosystem of support. After years of relying on shrinking devices to improve power, performance and cost, entire market segments are rethinking how they will approach new markets. This is a big win for architects and it adds huge creative options for design teams, but it also will spur massive development along the way, from tools and IP vendors all the way to packaging and process development. It’s like hitting the restart button for the tech industry, and it should prove good for business for the entire ecosystem for years to come. What Does AI Really Mean? eSilicon’s chairman looks at technology advances, its limitations, and the social implications of artificial intelligence—and how it will change our world. An artificially intelligent, wearable system that can predict if a conversation is happy, sad, or neutral based on a person’s speech patterns and vitals. 1. the pulpino group doing binaryConnect , 2 orders of magnitude gain. 2. Analog compute, via [a] or isocline/isosemi , gains : 100x cost, 10,000x ;power. btw isosemi also work on a general SIMD processor using analog for compute, and had a gps chip at isscc with 66x lower power. So AI chip crunches data faster. The big question is, what sort of data? Who provides the data? How do you know if the data is good? How does one verify that the output from the AI chip is good? Can AI chips have bugs? Who’s fixing the AI code? Who’s writing new code to process new events ? John, those are all good questions. The data presumably will be provided by the vendors using AI services, but who provides the algorithms remains to be seen.